PRINT THIS Marine VHF UHF channel list and save it. You will need it later. 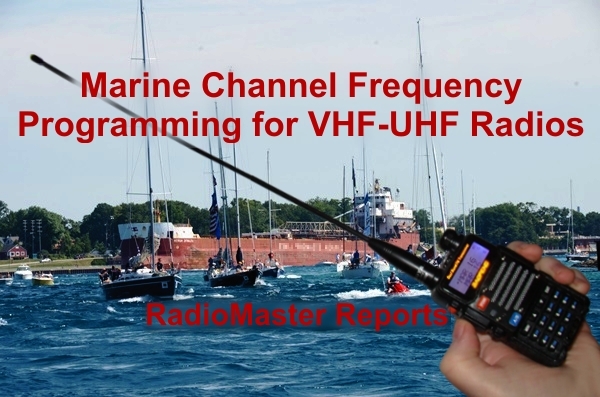 PRINT THIS Marine VHF UHF channel list and save it. You will need a USB-to-Radio programming cable that is made for use with your radio. One end plugs into the USB port of your computer and the other plugs into the microphone jack of your radio. Program your radio with free Chirp software. Download the .csv freq file below and import it into Chirp. Upload the file to your radio. Check your radio for proper operation. BAOFENG UV5R .img file for use with Baofeng UV-5R radios only. BAOFENG UV5RVplus .img file for use with Baofeng UV-5R V2+ radios only. .CSV file for use with all radio types. Import into Chirp. Accidents happen on the water, just like they do on land. All ships and boats should have a proper VHF marine radio and keep it tuned to Channel 16 for normal safety and distress calls. 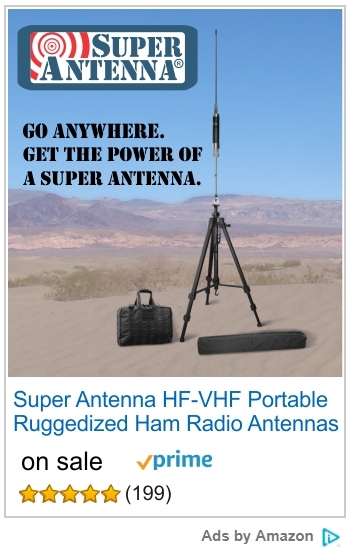 The cost of a bonafide Marine VHF radio is not high. But, mariners also like to keep a backup radio on hand for when the main radio goes out or the marine VHF walkie talkie gets lost. Also, there is a need for UHF among some users, especially for operation with cruise ships and industrial operations. 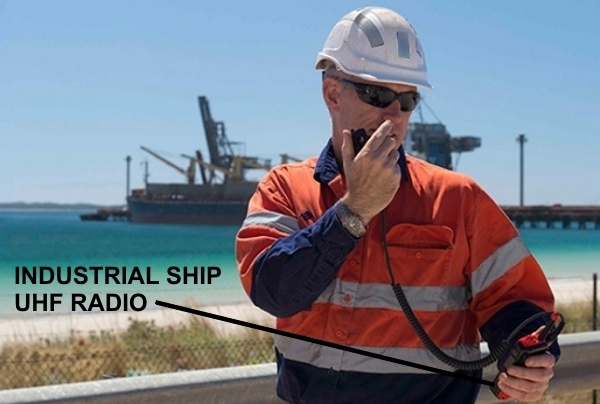 Larger ships, and especially petroleum industry vessels issue intrinsically safe radios to their crews. These are sealed to prevent any internal sparks from igniting fuel on board or at port. UHF capability is a feature that is not often found in lower priced marine VHF HTs. 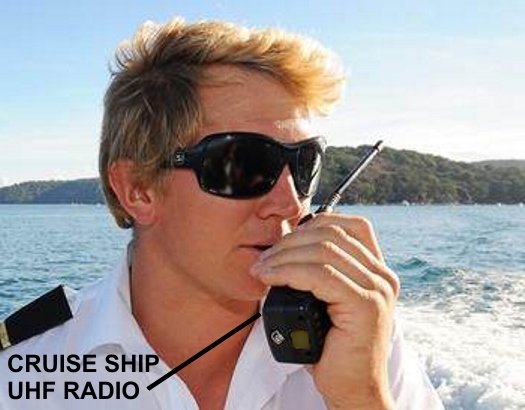 Ship crews often use separate UHF-only radios for on board comms. Fortunately, modern VHF-UHF walkie talkie HT handheld transceivers are inexpensive (in the $25 range) and ubiquitous. With the programming file provided here, they have all the channels and communication capability of a marine VHF HT plus a UHF HT. Such inexpensive radios can easily be acquired online or even in the local radio electronics shops of ports all over the world. These days, all crew members can easily afford their own personal radio, and now they never need to be without a backup radio of their own. Add a longer whip antenna (in the $12 range) on them and the VHF distance performance can be quite good for intership or ship-to-shore. Sure, many of the cheaper radios are not waterproof, rugged, or intrinsically safe; and they certainly aren’t maritime-rated or type accepted for marine service, but they will still communicate adequately. The audio quality is usually good enough that the party on the other end of the transmission won’t even suspect what type of radio you are on. Keep it in a sealed zip lock plastic bag or water sports radio bag and it should provide many years of backup service. The radio might even save the life of you and your shipmates some day. The download channel files are set to scan channels 16 and 13. 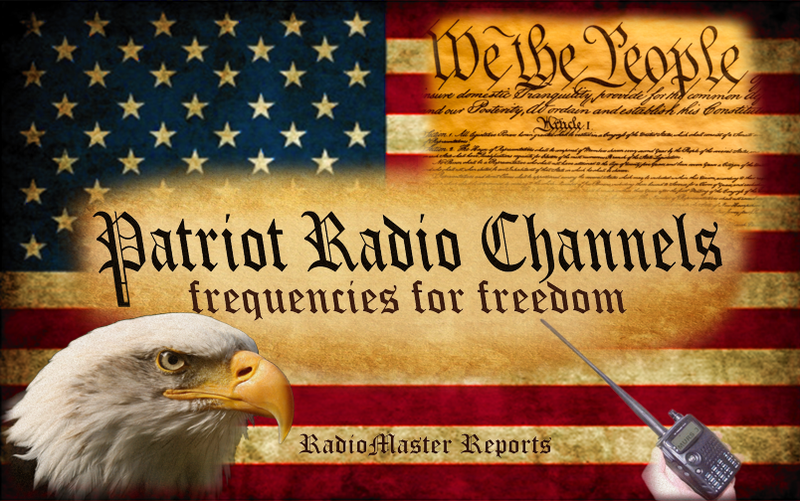 UHF frequencies are part of the channel list. These are not VHF marine channels, but they are the UHF marine channels commonly utilized on board large vessels, such as cruise ships and ferries. Ships also may have UHF repeaters on these frequencies for use by the working crews. There are 6 sets of paired channels. The 457 MHz range is common to both european CEPT and USA/North American ships. The channels in the 467 MHz range may vary by the area where the vessel is from. The UHF channel names with A designators are european CEPT and the channel names with B designators are USA/North American. Example: Channel UHF1B is a USA/North America channel at 467.750000 MHz. The repeater offset is 10.000000 MHz for CEPT vessels and 10.225000 MHz for USA and North American vessels. Duplex UHF repeaters with either (-) Negative or (+) Positive splits are common on vessels. Most on board UHF ship radios utilize PL or CTCSS sub-audible tone squelch, although some use DCS digital coded squelch. The most common PL tone (88.5 Hz) is provided as a default in the programming list, but you may need to manually change the programming of that default tone on a channel to another specific tone frequency, to be compatible with a specific ship channel. The programming list uses carrier squelch for receive, so you can always listen to all transmissions by ships on the UHF channels, but they probably will not hear your transmission unless you change the PL transmit tone to the same tone as they are using. These same UHF channels are also found around major shipyards, freight docks, freighters, tankers, industrial marine sites, oil platforms, ports, and many other types of marine sites. A few additional walkie talkie channels are provided in the programming list. 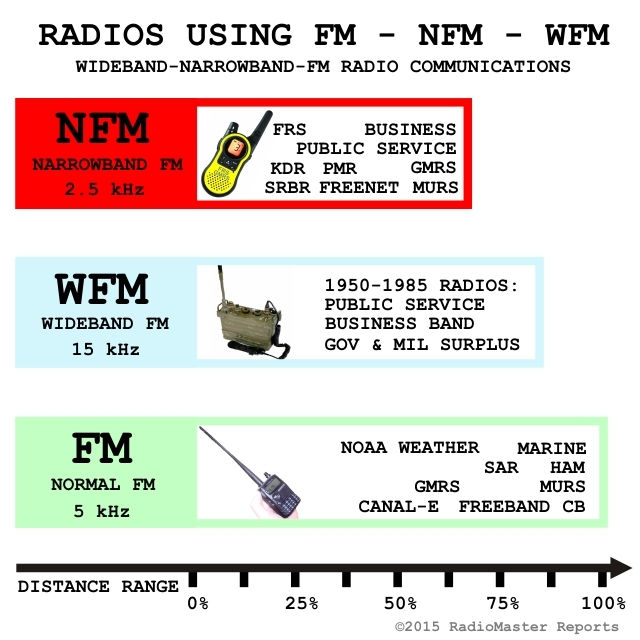 These include FRS, PMR, FreeNet, MURS, etc. 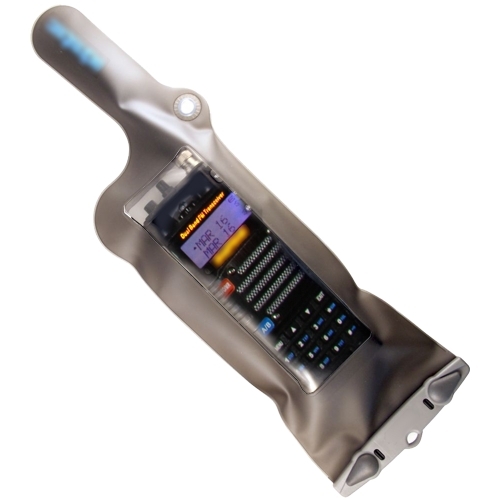 They may come in handy to communicate with common bubble pack radios or other non-marine HT radios that are often encountered around marine environments. 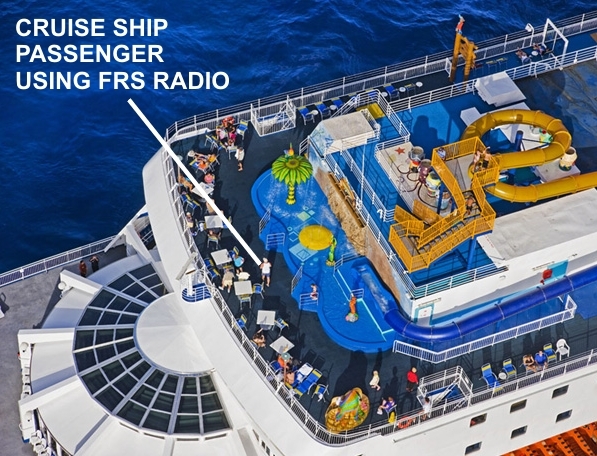 It is very common for passengers on cruise ships to use PMR Personal Mobile Radio or FRS Family Radio Service radios while on board, on shore tours, and in ports. New maritime VHF channels which are interleaved between the existing channels are now available for use by suitably equipped vessels in some areas of the world. These new channels are numbered in the 200 series, and they are spaced at 12.5 kHz intervals from the previous channel frequencies. The use of these channels is in addition to the existing channels, and they do not replace the existing channels. Channel 16 calling, distress and safety channel remains the same, and the interleaved channels adjacent to it are reserved and not utilized in the interleaving plan, to prevent interference. Additionally, new AIS automatic identification system vessel tracking channels have been added, and new AIS services are being expanded in some areas. As part of the spectrum efficiency process called narrowbanding, the international maritime VHF band will also be further interleaved with 6.25 kHz spaced channels in the near future. More digital services and digitized voice modes will be applied to these channels. The narrowband 6.25 kHz marine VHF channels will have channel numbers in the 1000 series. New Marine VHF 12.5 kHz Channel Frequencies Interleaved. Also known as the 200 channels. ITU-R M.1174-3 UHF MARINE channels (release date 2015) international standard list of UHF marine frequencies for use on vessels. This chart includes the original 6 channels (mostly analog FM at 25 kHz channel spacing). The 25 splinter channels (analog or digital at 12.5 kHz channel spacing). The new narrowband digital channel numbers 102-161 and 202-261 are interspersed (at 6.25 kHz channel spacing) between the splinter channels. The international standard for split frequency duplex is for base or repeater on the Lower Channel, but some vessels utilize the opposite of this standard. Submission of monitoring reports, imagery, errata, and detailed information is encouraged by RadioMaster Reports. This entry was posted in marine, maritime, radio programming, UHF, VHF and tagged 1000 marine channels, 200 marine channels, Baofeng, Baofeng programming, Channels, chirp marine, comms, communications, Frequency List, FRS, ITU-R M.1174-3, marine 12.5 kHz channels, marine chirp, marine chirp file, marine interleaved channels, marine uhf channels, marine uhf frequencies, marine uhf frequency, marine vhf channels, marine vhf frequencies, marine vhf frequency, maritime uhf frequencies, maritime vhf channels, maritive uhf channels, new marine channels, PMR 446, shtf communications, Survival, UHF, uv5-r, VHF. Bookmark the permalink. Hi. I have a pair of these radios and I am trying to get a PTT to work with them with no luck at all. The system I am using is an eBay special, military style headset with the oversized 4 way plug and a PTT button with a 2.5m plug for the radio end. The speaker works fine but the PTT either doesn’t work at all or will activate the mic for a second and then it shuts off. Any tips would be appreciated, I am having a real hard time finding anything useful (read very ammature level) for this. thank you for inform us. I feel happy to know industrial Communicative operation of radio. for a long times i would attempted to create frequency programming and make free channel conditionally same communication operation Icom and pptf were can’t resistant water proof and crash accident. so i need metal cover absolutely strength frequency channel file. Thank you for the file! I was going to start typing every channel in by hand before coming across this post. It saved me quite a bit of time! Thanks for this article, saves me a lot of research. And the printable image is very handy indeed! The list is correct. You appear to be confusing the memory position number with the channel number (channel name). MAR09 is 156.450 MHz. Be sure to use Channel Name for your display.